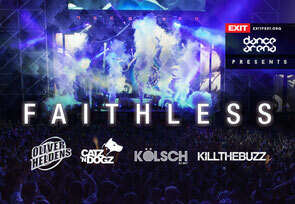 One of the biggest electronic music acts of all time, Faithless, will perform a full live set in the EXIT Dance Arena in Serbia on 12 July, bringing the event to a close with a bang. The group return to the stage for a series of special performances that mark 20 years of existence by remixing their ‘Faithless 2.0’. Other artists joining the Dance Arena line up include Oliver Heldens and Kill The Buzz, Danish producer Kölsch, as well as Catz ’n Dogz. Alongside modern versions of tracks such as ‘Insomnia’, ‘God Is A DJ’ and ‘We Come One’, ‘Faithless 2.0’ also contains three brand new tracks. This way, Faithless will round off seven studio albums and many singles, sold in over 15 million copies, with some of them reaching numerous chart tops. Faithless’s creative core consists of frontman Maxi Jazz, the multi-instrumentalist Sister Bliss, as well as their producer, Rollo, who works under the radar and does not perform concerts with the band. From complete anonymity, in July 1995, the band released their debut single ‘Salva Mea’, which ended #1 on Billboard’s US Hot Dance Club Songs, and in the top 10 of various European singles charts. Their global popularity was confirmed after the release of one of the most important tracks in the history of electronic music, the hit-single ‘Insomnia’ from the multi-platinum selling ‘Reverence’. A few years later, ‘God Is A DJ’, the other electronic music anthem came out, and in 2001 saw another dance mantra ‘We Come 1’. At an early age Oliver Heldens keeps pushing himself further and further gaining many fans worldwide and having huge success with his music and DJ career. Joining him will be the Polish duo of Catz 'n' Dodz, head honchos of Pets Recordings. In 2013, Kölsch’s LP '1977' arguably redefined techno, while Kill the Buzz are one of the newest names on the scene in recent years.